So what is this LPG stuff anyway ? First off, LPG does NOT, I repeat NOT, stand for Low Pressure Gas ! It stands for Liquid Petroleum Gas. So just what is it ? Well LPG is actually a family of different products, but the two most commonly found are Butane and Propane (or in some cases a mix of the two). 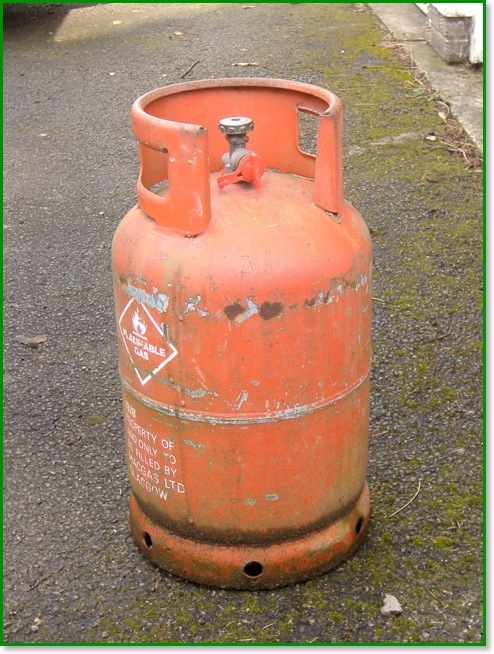 Many of you will be familiar with blue cylinders of gas used when camping or caravanning - these are mostly Butane, but occasionally red cylinders containing propane. For our discussions, we are only really interested in propane, which is what comes out of the pump at the garage. Propane is a hydrocarbon containing 3 carbon atoms and 8 hydrogen atoms, chemists would write it’s formula as either C3H8, or more commonly as CH3-CH2-CH3 to indicate it’s structure as well as composition. When sat in a tank, it can be kept liquid at anything from about 3bar to 10bar pressure depending on the temperature - if you let it out as a liquid, it will boil at about -40˚ (yes, minus 40 degrees) at atmospheric pressure. There is absolutely no difference between the stuff in the red cylinders, the stuff you get from a filling station, and the stuff you might find in someone’s garden to power their cooker. It’s all commercial propane - the only difference is how much the taxman taketh ! Gas sold for heating has no road fuel duty and a lower rate of VAT, gas sold for road fuel had road fuel duty and the standard rate of VAT - that is the only difference.